OTO Melara started with an artillery factory in Italy and is now active in Naval, Land and Air Weapon Systems with state-of-the-art technologies. OTO Melara is organised according to different product lines, with production and R&D capabilities ranging from Turret Weapon Systems and Naval Gun Systems to Missile Launchers, from Conventional to Guided-Ammunitions, and from Combat Vehicles and Artillery to Anti-Aircraft Systems and UGVs. In this feature, we cover the OTO Melara 127/64 V4 Naval Gun System as well as the Vulcano Family of Ammunition, which has Naval and Land applications and is currently undergoing a contract with the Italian MoD, and is also of interest to the Indian Navy. OTO Melara has the complete range of Naval Systems, from 12,7mm up to 127mm. The 76/62 SR is the new technology capable to face the most challenging threats. 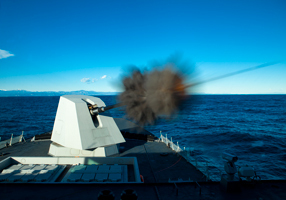 The Gun, with 58 Navies worldwide, is a Multi-Role Medium Caliber Naval Gun Mount, designed for Anti-Missile and Anti-Aircraft roles, and conceived for installation on ships of any class and type.